Extreme tides set for February and September 2015. The ebb and flow of tides has fascinated mankind for thousands of years. Our understanding of how the worlds’ oceans respond to the gravitational forces of the Sun, the Earth and the moon has developed thanks to contributions from some of the most eminent scientific names in history: Newton, Bernoulli, Laplace and Lord Kelvin. Thanks to their work, modern computing power can now calculate tidal patterns many years ahead in just a few seconds. For many places around the UK coastline the tides in 2015 will be the highest for tens of years. The majority of locations will see their highest tides around the 29th or 30th of September this year but some will experience extreme tides on 21st February. Details of the highest tides each year can be found on the website of the National Tidal and Sea Level Facility (NTSLF). Tides are controlled by well-known astronomical cycles. Every fortnight - at new moon or full moon - the Earth, Sun and moon are in a straight line which causes an increase in tidal ranges. These higher than average tides are called spring tides (the word is thought to derive from the German or Anglo-Saxon word to “leap up”). Yet some spring tides are higher than others. Tidal forces are strengthened if the moon is closest to Earth in its elliptical orbit (astronomers call this perigee). Tide generating forces are also enhanced when the Sun and the moon are directly overhead at the equator. For the Sun this happens on or around 21 March or September (the equinoxes). Spring tides are always higher at these times of year. The moon’s orbit also takes it above and below the equator over a period of 27.2 days. Just as with the Sun, the tide generating forces are greatest when the moon is directly overhead at the equator. Very large spring tides occur when these astronomical factors coincide. Approximately every 4.5 years the moon is closest to the Earth, and is also overhead at the equator, at either the March or September equinox. 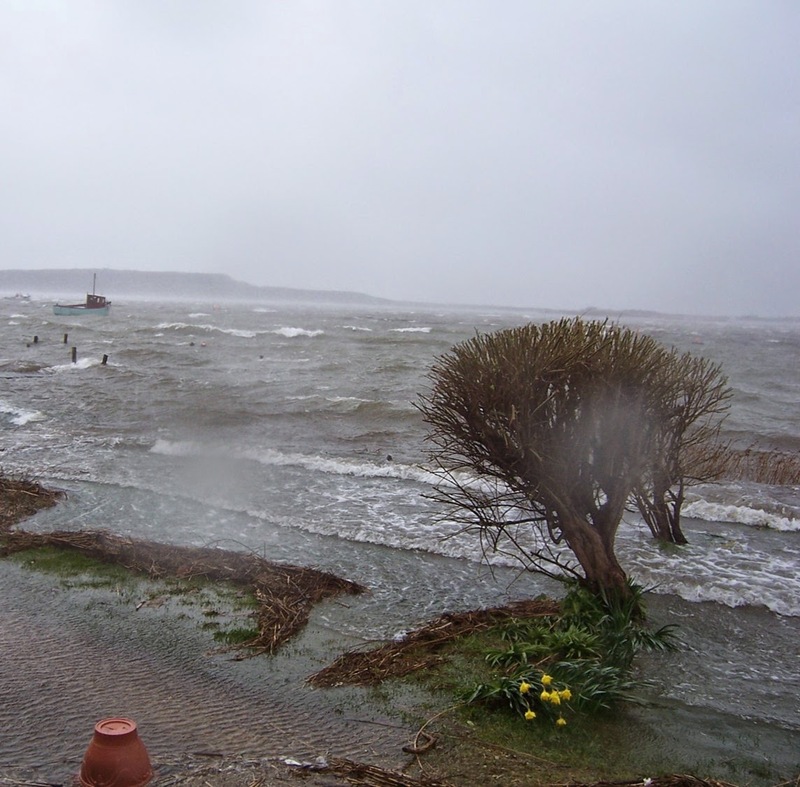 In some places, these extreme tidal conditions can cause water levels to be 0.5m higher than a normal spring tide. But it is important to remember that stormy weather has a greater impact than exotic tides. Storm surges, due to low pressure and high winds, can raise sea levels by up to 3m around the UK coastline. The high tides predicted for 2015 are due to a very slow change in the moon’s orbit, which is inclined to the plane in which Earth orbits the Sun (1a). The moon’s orbit cuts this surface at an angle of approximately 5 degrees. Over 18.6 years the moon’s orbit slowly rotates around so it cuts through the solar orbit in a different place. This so-called nodal cycle has the effect of changing how far above or below the equator the moon can reach in its orbit. In 2015 the moon’s orbital excursion above or below the equator takes the minimum value of 18 degrees. This slightly increases the chances of the moon being directly overhead at the equator coinciding with the other factors that contribute to extreme tidal forces. Scientists at Liverpool pioneered the modern scientific study of tides. From 1924 until the late 1950's tidal predictions for two-thirds of the world were calculated at the Liverpool Observatory and Tidal Institute – which eventually became part of the National Oceanography Centre (NOC). The first ever public tide table, essential for navigation and commerce, was published in 1770 based on observations made by William Hutchinson who was the dock-master at Liverpool. “NOC scientists continue to lead the world in the study of tides and all factors contributing to sea level change. The 18.6 year cycle is a fascinating result of heavenly motions. Whilst many features of tides have been known for centuries we are still making new discoveries – for instance we recently showed how slow changes in global sea level can affect the ocean tides”. (1a) plane is a two-dimensional surface - imagine an enormous sheet of glass containing Earth’s orbit around the Sun.